Beyond Brady: What To Expect In Tonight's NFL Season Opener : The Two-Way With his four-game suspension overturned, embattled New England quarterback Tom Brady will be under center for tonight's game as the Patriots take on the Steelers. The last time the New England Patriots played the Pittsburgh Steelers was Nov. 3, 2013. The Patriots won 55-31. Tonight at 8:30 p.m. 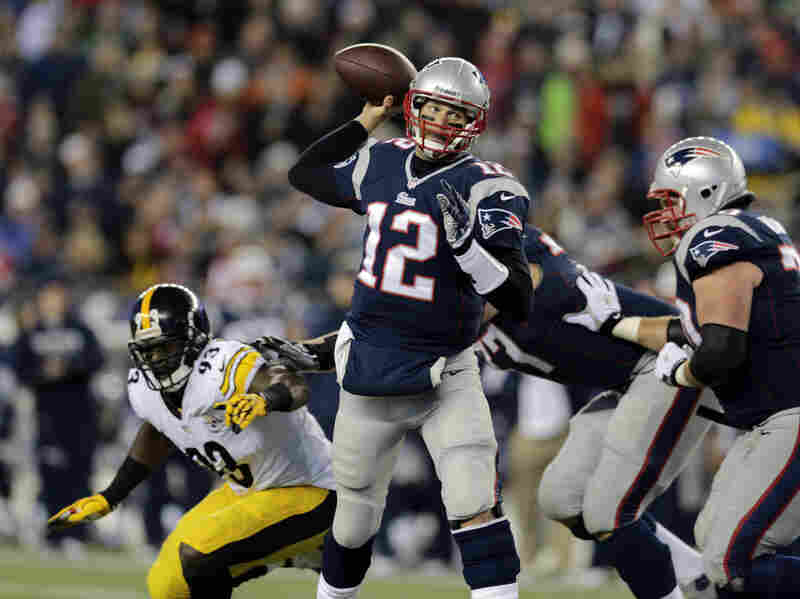 ET the New England Patriots will play host to the Pittsburgh Steelers in Foxborough, Mass. The contest's prevailing narrative is sure to focus on the Patriots' quarterback Tom Brady, whose suspension for his alleged role in the Deflate-gate scandal was overturned last week. But there's more to this game than the return of one man. Suspensions for both teams will be a factor. Patriots running back LeGarette Blount, Steelers running back Le'Veon Bell and Steelers wide receiver Martavis Bryant are all suspended for violating the NFL's substance abuse policy. With Blount and New England wide receiver Brandon LaFell also benched due to injury, Brady will be left with limited options. Luckily for him, star tight end and twerk-master Rob Gronkowski will be one of them. The Patriots are favored to win. Las Vegas odds favor the Pats by 7, up from the 2.5-point favorite they were before Brady was exonerated last week. But what we saw from Brady's preseason performances doesn't inspire much confidence. He completed 10-22 passes for a measly 107 yards, and threw for one touchdown in three preseason games. Still, that's based on a relatively small sample size. The Steelers boast an impressive offensive combo. Steelers quarterback Ben Roethlisberger and wide receiver Antonio Brown are one of the most potent offensive duos in the league. Last season, Roethlisberger was No. 2 in the league for passing yards with 4,952. He also threw for 32 touchdowns. Brown led the league in receiving yards, recording 1,698 along with 13 touchdowns. Especially with former Patriots corner back Darrelle Revis gone to the Jets, the New England defense will likely have its hands full. Roger Goodell won't be in attendance. Claiming that he doesn't want his presence to distract from the football, the beleaguered NFL commissioner (who issued Brady's since-overturned four game suspension) will break tradition and watch the season opener on TV.